What is the definition of Malignant Otitis Externa? It is persistent severe ear infection that extends to involve the bone and soft tissue of the skull base. It is also known as "necrotizing external otitis" as it is an aggressive infection rather than a malignancy. - Diabetes: More than 90% of patients with malignant otitis externa have diabetes. - Low immunity: as in AIDS and patients who take chemotherapy. What are the causes of malignant otitis externa? Organisms: Pseudomonas aeruginosa and Staphylococcus aureus are the most common causes, Proteus also exists in some cases. Incidence: It occurs mostly in Old, diabetic patients. Severe deep-seated pain, worse by night or by moving the head (Otalgia). Persistent foul-smelling yellow or green (purulent) discharge (Otorrhea). Persistent itching in the External auditory canal. Facial muscle weakness up to facial paralysis. Laryngitis may occur, leading to loss of voice. Granulation in the floor of the external meatus producing scanty sanguineous discharge. 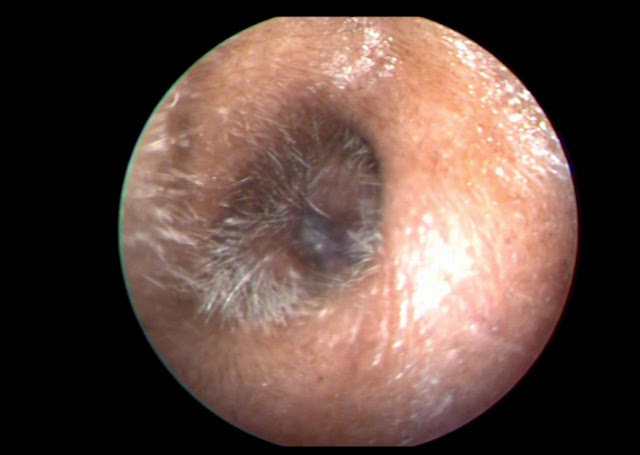 Tenderness over the floor of external auditory canal, exacerbated by pulling on the pinna and putting pressure over the tragus. Preauricular, Postauricular and and lateral cervical lymph nodes show the picture of Lymphadenopathy. If the infection extends to the temporomandibular joint and Parotid gland, Trismus may occur. Lab. tests: Blood glucose, ESR and Kidney function tests. C.T temporal bone and skull base. Bone scan to assess severity and progress. PTA to assess the hearing. How to diagnose malignant otitis externa? Diagnosis of a case of malignant otitis externa depends on taking complete medical history to recognise predisposing factors as discussed above, and medical examination that should be confirmed by investigations. Squamous cell carcinoma of external audiory canal. Simple otitis externa (responds to topical antibiotics doesn't go beyond the soft tissue of EAC). What are the possible Complications of Malignant O.E? Local spread to the base of the skull due to osteomyelitis producing paralysis of the facial, glossopharyngeal, vagus, accessory and hypoglossal nerves. 2- Control of Diabetes Mellitus. C. Third or forth generation cephalosporins. 4. Local: Aural toilet and topical antibiotics. 5. Surgical debridement: only minor removal of dead bone. Grandis, JR, Branstetter, BF, YuVL. "The changing face of malignant (necrotising) external otitis: clinical, radiological, and anatomic correlations". Lancet Infect Dis. vol. 4. 2004. pp. 34-39. Carfrae, M, Kesser, B. "Malignant Otitis externa". Otolaryngol Clin N Am. vol. 41. 2008. pp. 537-549.